One of Mayor Nutter’s first orders of duty when he took office in 2008 was his pledge to double the percentage of Philadelphians with bachelor's degrees over the next decade. Carolyn Terry did not miss a beat in taking advantage of these educational initiatives, and this year, she is graduating with a bachelor’s degree in Business Administration from Peirce College. 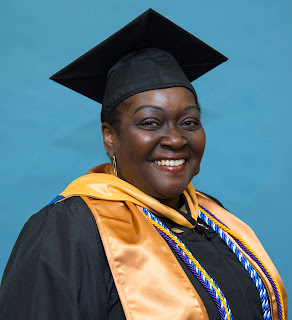 We had a chance to talk to the 55-year-old mother of four about going to college while working and supporting her family, and what she plans to do with her degree. Here is her story. Tell us why you started thinking about returning to school. the end of my work day. When did Peirce enter your radar? The mayor offered city employees a tuition discount and application fee waiver if they considered one of the institutions that were a part of the Return to Learning network. Peirce was one of those institutions. Peirce has always held a special place in my heart. My oldest son graduated from Peirce in 2001 with his Associate degree in hospitality management. . His wife is also a Peirce graduate and now a professor in the Graduate program at Peirce. My third son, Andre, is currently attending Peirce and is working on his Bachelor’s degree in Business Administration. What was your experience like at Peirce? Peirce was an excellent educational experience for me. I love the support that Peirce extends to current students. The first great experience was the Walker Center. If you’re struggling, there’s someone at the Walker Center to help you. The second great experience was the availability of Peirce instructors—being able to email and call a professor and receive a timely response. I felt like it was one-on-one learning. Another great experience was the leadership retreat with the Walker Center. These services enhanced and improved my learning experience tremendously. What was it like balancing family life with school? All my sons are grown and I have two at home with my husband. For me, the balance was saying no to my family or friends’ invites. The juggle for me was being sensitive to family needs and also being mindful of my commitment to do well in school. What tips and tricks did you learn for achieving a good work-life-school balance? I was committed to making Saturday and Sunday homework time. No if’s, and’s, or but’s about it. I tried to get laundry and housework done during the week. I asked my sons to chip in more than they usually do. I used the Peirce library as my study haven. I would go to the Peirce library to complete an assignment or do further research during my lunch hours. With an accelerated degree program, it’s about making the best use of your time. What advice would you give to other working adults who are considering going to college? Make school a priority. Be committed to your classes. Don’t expect more from the teacher than you’re willing to give. Any final thoughts about going to college as an adult learner? I can’t thank Peirce enough. For everything that looked like an obstacle to me, there was someone at Peirce that helped me overcome it. Peirce had the computers I needed when my laptop broke. Peirce found me scholarship money. The commitment Peirce has to its students, for me, it was just awesome. I don’t know if I would have been successful anywhere else. Congratulations on earning your degree, Carolyn! Best of luck and we look forward to seeing you at Commencement 2015!